Lungs are mainly affected by an infectious disease called Tuberculosis (TB); you must be aware about signs and symptoms. Tuberculosis (TB) is a disease that primarily affects the lungs. It is a potentially serious disease that is infectious. The bacteria that cause the disease can be spread from one person to another through airborne droplets from coughs and sneezes. There are many strains of tuberculosis, which do not respond to most drugs for treating the disease. The treatment usually takes several months involving several types of medications. Remark the Tuberculosis Signs and Symptoms. Shutterstock images. Tuberculosis is directly caused by bacteria which spreads from one person to another through microscopic droplets that are released into the air. The droplets are from someone who is untreated and has an active form of tuberculosis when he/she speaks, coughs, spits, sneezes, laughs or sings. Tuberculosis is contagious, but it is difficult to catch. A person is more likely to get it from someone he/she is living or working with than from a stranger. A weakened immune system due to diseases like HIV/AIDS, severe kidney disease, cancer and diabetes. Traveling or living in particular places like India, China, Pakistan and Russia. Living with someone who has TB that is not being treated. Latent TB – The person has TB infection, but the bacteria are in an inactive state and it doesn’t cause any symptoms. It is also called inactive TB, which is not contagious, but it can turn into active TB thus the need for treatment. 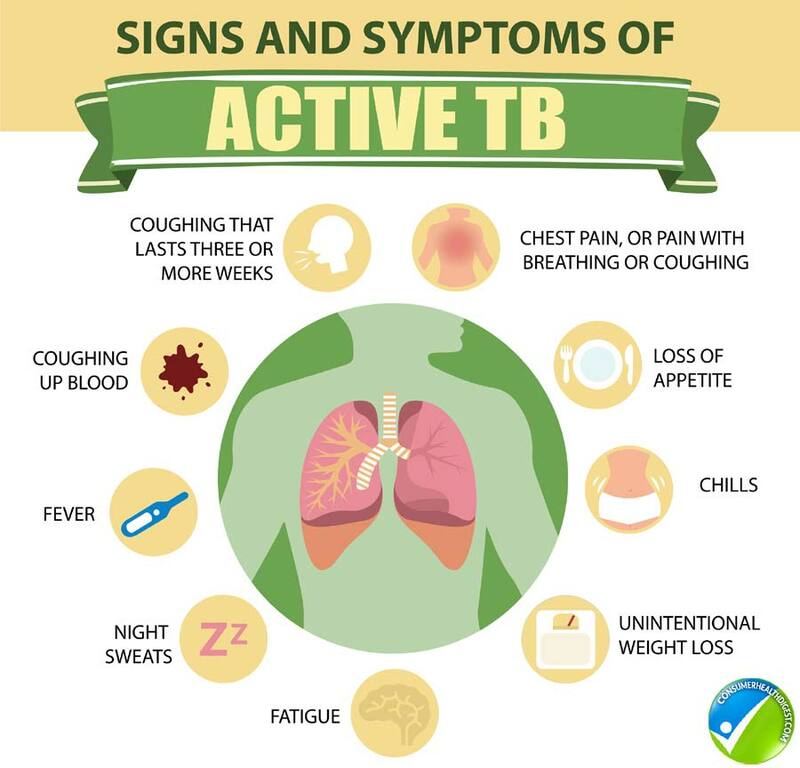 Active TB – This is when the condition makes the person sick and it is contagious. It occurs during the first few weeks after infection, but can also occur years after infection. The first step to diagnosing TB is a thorough physical examination wherein the doctor checks the lymph nodes for swelling and lung sounds are carefully checked using a stethoscope. The most common diagnostic tool for TB is a skin test, although blood tests are becoming more common. In the skin test, a small amount of PPD tuberculin is injected just below the skin in the inside forearm area. It will be inspected within 72 hours. If there is a hard, raised bump, then the person is likely to have tuberculosis. However, this test is not always accurate so in many cases blood tests are also used to confirm latent or active TB. Imaging tests can also be used to check the location of the infection or see if there are changes in the lungs caused by active tuberculosis. Sputum tests may also be taken for laboratory examination to test for TB bacteria. It can also be used to check for strains of tuberculosis that are resistant to drugs to help determine the best medications. Medications are crucial for treating tuberculosis, but it takes a lot longer compared to other bacterial infections. With TB, the patient needs to take antibiotics for at least half a year and sometimes up to ninemonths. The drugs used and length of treatment depends on the patient’s age, overall health, drug resistance, form of TB and location of infection. For drug-resistant TB, antibiotics (fluoroquinolones) and injectables (kanamycin, amikacin or capreomycin) are used for a longer time period (about 20 to 30 months). There are some types of TB that have already developed resistance to such medications. There are newer drugs used as add-on therapy for treatment of drug resistant TB, including bedaquiline, sutezolid, diamond, linezolid and PA-824. It is crucial to complete TB treatment even though you feel much better after a few weeks of treatment. Any patients stop taking their medication but the problem is that this allows the remaining bacteria to develop resistance to the drug. This will often result to TB that is much more severe and difficult to treat. Therefore, it is very important to take the medications cautiously according to the doctor’s instructions. In addition, try to eat healthier by consuming natural foods that are rich in nutrients and antioxidants. Regular exercise can also help with recovery as long as it is approved by your doctor.